The emergence of Internet and portable devices like Laptops/PDA and mobile phones have bought a great change in the communication and entertainment world. However, unfortunately, the teaching and learning methodologies in the secondary schools and pre-university colleges in India have remained almost stagnant over the last several years. There have been few rigorous efforts, especially, in Europe and USA to enhance the education system using the latest technological tools. However, the outcome has not yet been very desirable. This work aims to use the mobile phones and other handheld devices as e/m-Iearning pedagogical tools in order to enhance technology-enabled interactive learning, keeping in mind the affordability and usability of proposed technology in emerging economies/developing countries like India, China, etc. We have developed a prototype for interactive wireless education solution" with two independent yet complimentary components- clicker response system and m-Iearning application, in order to cater to two different spectrums of users. The low-cost clicker response system is developed primarily for students in schools and colleges, while the m-Iearning application is being developed for students in colleges and professional institutions, keeping in mind the fact that most of the students today in these institutions have Bluetooth-enabled mobile phones. This not only enables interactive learning using wireless devices but also provides multimedia-based bi-directional transfer of information between the students and the teacher. 2Mahendra Engineering College, Mahendrapuri, India. 3Anna University - Coimbatore, Coimbatore, India. A planned insertion of faults or errors into software in order to determine its response and to study its behaviour is understood as Fault Injection. Fault Injection have proven to be an effective method for measuring and studying response of defects, validating fault-tolerant systems, and observing how systems behave in the presence of faults. The approach offers both accuracy of fault injection results transparency of the system dynamics in the presence of faults. The objectives of this study are to measure and study defect leakage, analyse amplification of errors and study Domino effect of defects leaked. The approaches endeavour to demonstrate the phase wise impact of leaked defects, through statistical analysis of defects leakage and amplification patterns of systems, built in domain (education, e-governance, retail, systems) variants using the same technology (C#. Net), and through a causal analysis carried out on the defects injected. Better understanding of the impacts of an incident may help analysts to design more appropriate incident management strategies. Very little is known to date about the usefulness of applying data mining in traffic and transport related research, although data mining has contributed its usefulness significantly in other fields. This research is intended to discover the relationship between motor vehicle accidents and the comprehensive information about people, vehicles, and conditions recorded in Police Accident Reports using data mining techniques. The data obtained from the traffic police accident database, are first clustered using the K-mean method. Then, by exploring the extracted patterns and rules, some refinements in behaviors are proposed. So by using this innovative method, regardless of the constraints of this study, useful knowledge about the enhancement of safety of driving and roads and managing the accidents are provided. There are many methodologies available for continuous improvement and quality improvement. 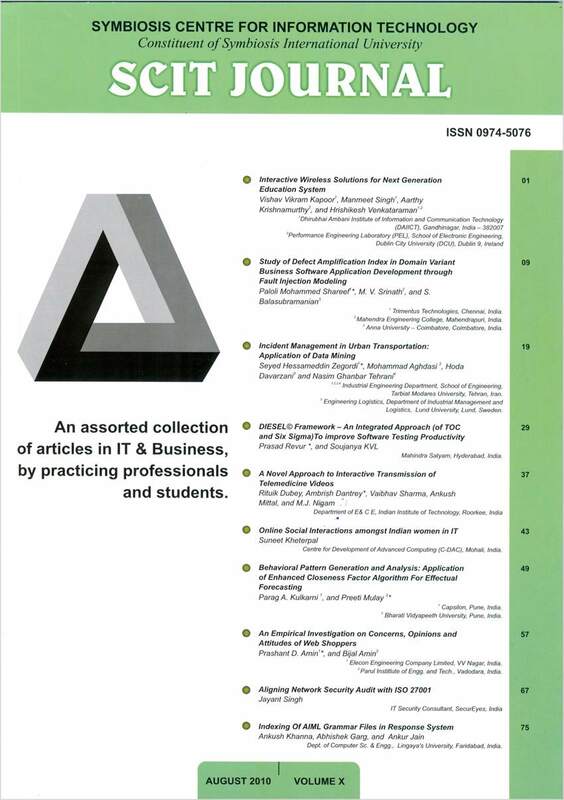 This paper proposes a new framework called "DIESEL" integrating Six Sigma methodologies and Theory of Constraints(TOC) approach to be used as a Continuous Improvement tool for improving quality and productivity in software testing. This also helps us to exploit the complementary benefits of both the approaches to find solutions in a complex testing process. A Case study is presented illustrating the application of this framework in a complex Software testing project where the productivity was affected by a few constraints. The solution developed using this framework improved the productivity while living with the constraints. Indian Institute of Technology, Roorkee, India. This paper considers an interactive telemedicine video transmission system which uses Region of Interest (ROI) based video compression scheme to enhance transmission efficiency and makes real time streaming of telemedicine videos possible. The system is an example of domain specific multimedia compression schemes, a research field which has not been fully explored yet. The scheme presented is based on observation that telemedicine videos generally have an ROI which is only a fraction of the overall frame area. Efficiency of the system is increased by using lossless compression on the ROI and lossy compression on regions apart from the ROI. On the initial frame called the template frame, the ROI is determined interactively by doctor herself and image registration is used for automatic determination of ROl on other frames. The scheme presented can be extended to other domains apart from telemedicine with modifying the ROI detection method. The cyberspace seems to appeal many women for the possibilities it offers for connecting, networking and sharing information. In a bid to understahd the usage of Web 2.0 as a social networking medium by technical women for personal as well as professional reasons, an exploratory study was conducted on married Indian women working in the field of Information Technology. While the professional reasons to access the social networks outweigh the personal reasons, few women are also discussing about themselves, their ambitions and desires. This is a good indication considering the fact that most Indian women keep their likings and personal life to themselves. Patterns and styles of interaction on the online social networks provide a glimpse into the overall portrait of the emerging Indian woman. Many organizations today have more than large databases; they have databases that change dynamically. In many classification systems this represents a huge problem, since changing data may lead to poor results in the absence of proper retraining. This paper aims at constructing the knowledge model incrementally for a dynamically changing database. It intends to solve the problem intrinsic to incremental Clustering, and obtaining a faster and more accurate result. It presents a clustering model, including initializing clusters, modifying the previously discovered knowledge using the new data without retraining the old data, and maintaining clusters and related behavioral patterns in pattern-database, for further re-use. To handle this proviso, we propose innovative incremental clustering method for incremental learning. To accommodate new data on arrival every time, to handle unlabeled data and to understand which cluster to update, requires knowledge amassing and learning based on the same. This proposed new incremental algorithm clusters continuous input, and outline research directions to deal with very large data sets. The proposed work called Enhanced Closeness Factor Algorithm for Effectual Forecasting [ECFAEF] and is based on finding closeness among data series. The outcome will be useful for forecasting and decision making, analyzing generated patterns and their behavior. ECFAEF is a smart algorithm which catchless exceptions in behavioral patterns, very easy to implement and understand. 1Elecon Engineering Company Limited, VV Nagar, India. 2Parul Institlute of Engg. and Tech., Vadodara, India. According to Internet World Stats, there were 45 million Internet users in India representing 3.5 per cent of the population as on January 2009. This was up by 700 per cent compared to 2000. (lnternetWorld Stats, January 2009). A brief review of Information Technology (IT) indicated that more than 70 percent of Internet users used Internet for sending and receiving e-mails followed with information search, chat sessions, and instant messaging .. The marketing implications of this research study can be assessed at two levels. First, at the level of the five dimensions viz., convenience, security concerns, personality, user experience and prices that the female online shoppers used to evaluate the relatively new marketing medium. Second, at the level of using findings on female online shoppers demographics and expectations to design and strengthen its communications strategies. IT Security Consultant, SecurE yes, India. This paper is an attempt to relate my freshly gained knowledge about the IS027001:2005 standard and its controls to a network security audit scenario. The paper tries to align the network security audit recommendations to corresponding controls in the IS027001127002 standard  . To achieve this I have taken a case-study of a business network for which network security audit was performed by our penetration testing team of SecurEyes. SecurEyes is focused information security consulting organization having head office in Bangalore, India. For purpose of this paper, the alignment of the audit recommendations and the applicable IS027001:2005 controls were done in the final report generated as part of the deliverables for the network security audit. Benefits of these controls include increased productivity, maximization of corporate assets, compliance with privacy regulations, protection from legal liabilities, preserving network bandwidth and resources. Dept. of Computer Sc. & Engg. When a response system is based on Artificial Intellig"ence Markup Language (AIML), it uses a compiler for processing the AIML grammar files for giving the appropriate responses. A compiler is being used that uses php and XML Dom for giving appropriate response to the user queries. At the time of user query, the compiler will search in a number of files of AIML grammar, which increases the complexity, ambiguity and processing time. To improve upon this, the technique of indexing can be used. In this paper, a way of indexing the grammar files is being presented. By doing the indexing part, the compiler does not need to search all AIML files and will only search the related files according to the entries in the index table, thus reducing the complexity and processing time.